This page provides information about vehicle and document requirements, state regulations, insurance coverage, and city-specific requirements, needed to drive with Lyft in the state of California. Be sure to follow these rules when giving rides in California, and keep an eye on your email for important updates from Lyft. If you're applying to drive in California, see the application steps. All vehicles must have 4 doors and 5-8 seats, including the driver's. Vehicles in all other cities must be 2003 or newer. 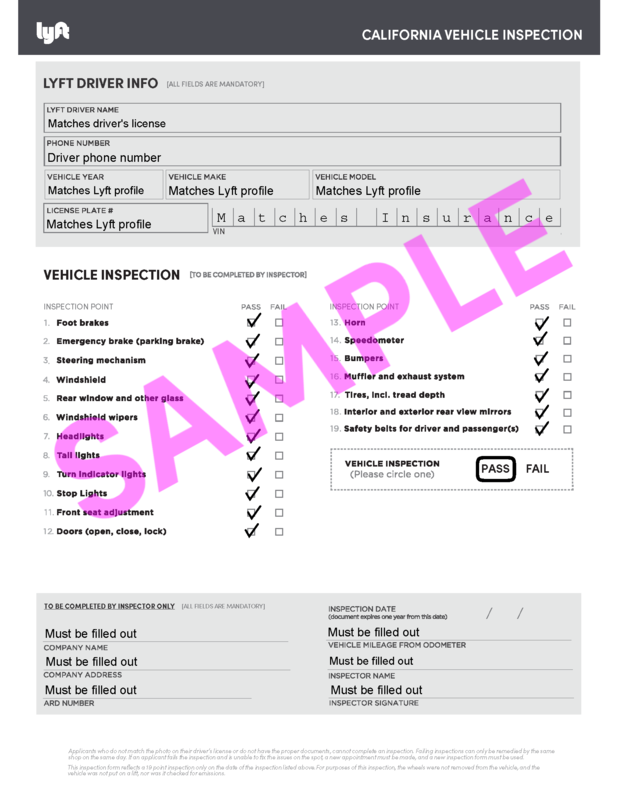 Lyft vehicles in California must not be titled as salvage, non-repairable, rebuilt or any other equivalent classification. To be approved, your vehicle must also pass an inspection at licensed California facility. The California Public Utilities Commission (CPUC) requires drivers to always display two Lyft emblems when in driver mode: one on the front windshield and the other on the rear windshield. Select the temporary emblem below to open in a new window so you can print it out. After you’re approved to drive, your Lyft emblems will arrive within 1-2 weeks. If you didn't get an emblem or need a new one, place an order in your Dashboard. You can print a temporary emblem while waiting for the official one to arrive. When giving rides at OAK, LAX, or SFO, you’re required to display an additional airport placard in your front windshield. View driving requirements for specific airports in California. Drivers are required to have a valid California driver's license. A temporary license is acceptable, but be sure to upload your permanent copy when you receive it. California driver’s licenses expire every 5 years. Vehicles on the Lyft platform in California must have a California license plate. Vehicle license plate registration expires annually. Drivers are required to have personal vehicle insurance issued in California. Personal vehicle insurance plans vary, and must be updated before your policy’s expiration date. To receive an inspection, bring a copy of this form to any licensed inspection facility. Inspections may cost around $20-30 but vary depending on the facility. Lyft doesn’t cover the cost of annual inspections or inspections for existing drivers. Vehicle inspections expire annually or every 50,000 miles, whichever comes first. Drivers in Inland Empire, Los Angeles, Orange County, San Diego, or the surrounding areas can visit one of the Hub or Pep Boys locations below for a free annual re-inspection. No appointment is necessary during operating hours at these locations, but please allow 30 minutes once you arrive. The city or county where you live may require you to obtain a business license if you drove with Lyft more than 30 days in the last fiscal year. If your local city or county doesn't require a business license, you don’t need to get a business license anywhere else to drive with Lyft. There may be additional requirements where you live. Refer to your local city or county's website for these requirements. Los Angeles County residents may need to register their business with the Office of Finance of the City of Los Angeles and obtain and hold a Tax Registration Certificate. View rules for registration. If you’re unsure whether the business tax rule applies to you, contact the City of Los Angeles Office of Finance. Orange County residents can find information about local business license requirements by selecting their city on Orange County's permit page. Unincorporated Sacramento County residents can obtain a general business license on Sacramento County's official page. Residents of incorporated cities within San Diego County are required to obtain a business license (Business Tax Certificate). Business licenses aren't required for residents of unincorporated cities within San Diego County. To apply for a Business Tax Certificate, follow these instructions from San Diego County. San Francisco residents who drove more than 30 days in the last fiscal year are required to have a business license, officially named a Business Registration Certificate. Heads up: After registering, the City may say you owe extra fees and late charges for driving in previous years. Don’t pay the registration fee until you get a specific email from the Treasurer and Tax Collector removing the penalties and interest from your account balance. Most drivers choose Sole Proprietorship as their Organization Type and use their legal name as their Business Name. You’ll also add your Business Tax ID and San Francisco Start Date. Heads up: Once you register for a Business Registration Certificate, the City adds the business name, address, and certain other details to the SF OpenData website. This means that other than your SSN, any data you share, including your address, will be public. This information may also be shared with San Francisco City and County tax-collecting entities. Your contact information may be the same as your ownership information from step 2. All tax information will be sent to the person and address you enter here. Tax and Fees: Most drivers select “No” for each tax and fee. Review this page to confirm which taxes and fees apply to you. Business Activities: Most drivers register as a Transportation Network Company Driver (17B). See more information about business activities codes. Estimated SF Gross Receipts doesn’t need to be an exact amount. If you drive in multiple counties, do your best to estimate San Francisco fares based on how often you’re in the city. See more information about gross receipts. Keep in mind the information above isn’t business or tax advice. For specific questions about applying for a business license or associated fees, see San Francisco's New Business Registration Instructions or contact the Office of the Treasurer & Tax Collector. San Jose residents can obtain a business tax certificate by submitting this application form by mail or in-person. In California, Lyft is regulated by the California Public Utilities Commission (CPUC). In California, Lyft’s standard time limit for driver mode applies. Effective July 1, 2015, California enacted State Bill AB 2293. Under this law, Transportation Network Companies, including Lyft, are required to provide primary third-party liability insurance and maintain $200,000 of excess liability coverage during Period 1. Lyft’s third-party automobile liability policy will be your primary policy during Period 1. 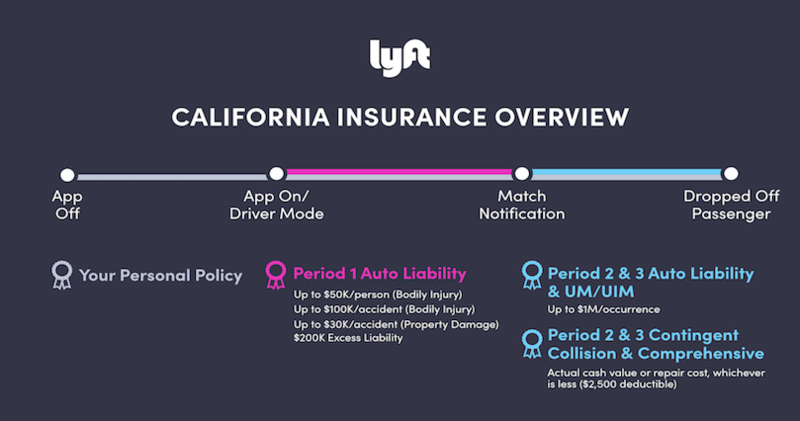 Lyft will also maintain $200,000 of excess liability coverage during Period 1. Period 1 begins when you log in to driver mode and ends when you accept a ride request. Once you accept a ride, Period 2 begins. Once you pick up a passenger, Period 3 starts. Period 3 ends as soon as you end the ride. Then, you’re back in Period 1 until you accept another ride request or log out of driver mode. Under AB 2293, your personal automobile insurance policy, including any optional coverages you’ve purchased such as comprehensive and collision, won’t cover your rideshare driving in California unless you’ve also purchased rideshare coverage. Some insurers offer insurance products designed specifically for rideshare drivers. These policies can cover both your personal and rideshare driving, and offer additional coverages. We try to keep drivers informed as new insurance products become available for rideshare drivers. We encourage you to reach out to your insurance agent for the insurance that best fits your needs. Clear photos of your California driver's license and vehicle insurance. If you already have a California driver's license or insurance on file with Lyft, you don't need to send them in again. Also make sure your vehicle meets requirements for California. If you’re moving from California to a different state, find your new state to see what documents you'll need.